The latest Edelstein Ink of the Year, 2017 Smoky Quartz, inspired Pelikan to create a matching translucent Special Edition Pen in the Smoky Quartz color. This new M200 series in fountain pen utilizes the Patented Pelikan differential piston mechanism. The Smoky Quartz series is now further enhanced with a Gold Plated Nib, Trim and Clip which compliment the rich brown-colored smoky shades. The beautiful M200 series is also offered in a matching Ball Pen, which features the classic push-button mechanism. The M200 Fountain Pen gold-plated, stainless steel nib is available in EF, F, M and B widths. 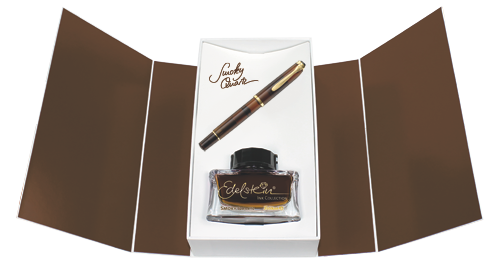 The new Gift Set contains one Smoky Quartz Fountain Pen and one bottle of Edelstein Smoky Quartz Ink.